Vendee en Vogue is an affordable, unique gifting service. The motto "Presentation means everything" is what inspires the unparalleled gifts created. Gifts for all price ranges are available, because the gift of giving is more valuable than the gift itself. Vendee en Vogue's main goal is to provide a gifting service for all people, no matter the budget. 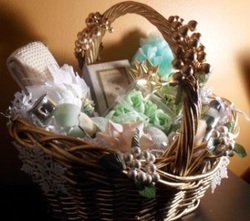 Also allowing those who want to give a personal touch by gifting a customized gift basket to purchase within there budget. YOU pick the budget and we will give you an offer you can't refuse. We always aim to please, no matter how big or small the order.